Like, favorite, +1: Why doesn't email have a favorite button? 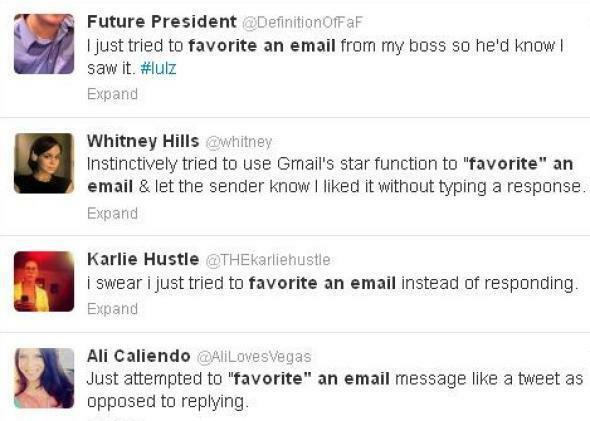 A Twitter search for “tried to ‘favorite’ an email” turns up a long stream of results. Ever try to “favorite” an email? You’re not alone. Like, really not alone. Same goes if you’ve tried to “like” an email. If you’ve tried to +1 an email, then OK, maybe you do have a problem. Ignore it and risk being rude, or worse, causing them to wonder whether you received their message at all. Spend a minute or two figuring out how you should reply to their reply. You want to do it in a way that makes them feel duly acknowledged and appreciated, but without overdoing it so much that you force yet another thoughtful reply from them, which in turn … You get the picture. Being the first person not to reply is like being the first person to pull away from a hug. Now, option two might not sound so bad if you’re the type of person who sits around all day without a whole lot to do. But let’s face it, very few of us these days are that type of person. A minute or two per email multiplied by upward of 100 emails a day equals a disturbingly large chunk of said day. And if you’re on a mobile device, forget it. I once spent seven minutes trying to tap out a one-paragraph reply on a Microsoft Surface tablet while riding in a taxi. I finally gave in and sent it with at least two spelling errors, three autocorrect errors, and a weird double-hanging-indent that I could not for all the world figure out how to undo. In that amount of time, I could have called the person up, thanked them effusively for their email, inquired after their family and mutual acquaintances, discussed the weather and the phase of the moon, and not been carsick at the end. Or I could have hit “favorite” and moved on with my day, knowing that I could still reply at greater length later on if need be. Does wanting a one-click favorite button make me lazy? Sure. But entire thriving segments of the consumer technology industry have been built on less laziness than this. As you read these words, several of the world’s largest technology companies are devoting tens of millions of dollars to high-end products whose chief function is to save people from having to pull their phones out of their pockets when they get a text message. Don’t tell me they can’t figure out how to put a favorite button on an email message. If you’ve got a better idea, or a reason why a favorite button would be infeasible or undesirable, feel free to drop a line in the comments section. If, on the other hand, you basically agree with me, no need to waste your time typing out a comment—we’ve included a handy blue like button at the top and bottom of the page.